ABOVE: Representatives from all sectors of water leisure gathered for the recent UK Pool & Spa Awards presentations. Open to all, regardless of trade-affiliation, the UK Pool & Spa Awards has earned itself a not-to-be-missed reputation as one of the water leisure industry’s most valuable marketing tools. 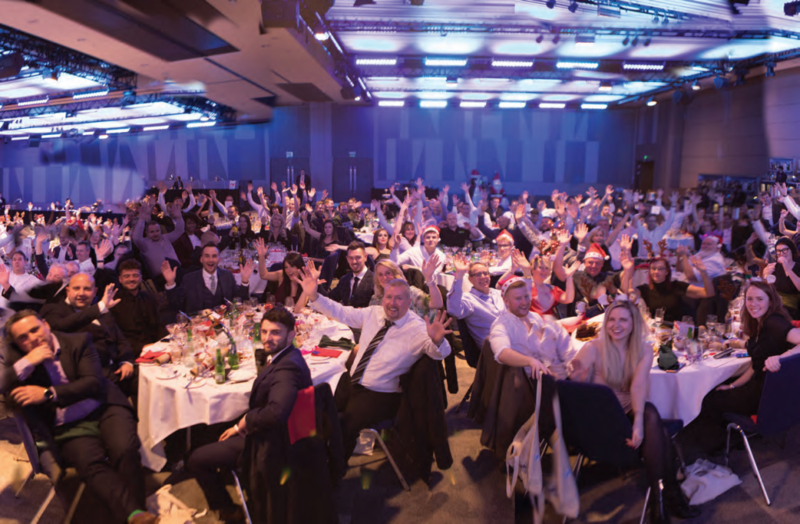 Spanning both the residential and commercial pool sector, this year’s competition entrants reads like a who’s who of the industry elite, many of whom took time out of their intensive schedules to attend Decembers’ packed networking and presentation evening held at prestigious Vox Conference Centre at Resorts World, part of the NEC complex in Birmingham. Winners across 30 categories were presented with trophies and certificates, at the business networking and promotions evening in December, attended by over 200 of the industry’s key personal including leisure operators, pool builders, designers, hot tub manufactures and retailers. “This year’s awards celebrated more winners than ever before while the quality and value of work being undertaken increases year on year,” commented Christina Connor, of Waterland Media, the event organisers. While house prices are predicted to dip due to Brexit pessimism, investment in home leisure is soaring as home owners opt to improve rather than move. The 20% rise in both indoor and back garden leisure facilities is being driven by people who are opting not to move but are also investing in relaxation, social and exercise opportunities in the convenience of their home. Christina pointed out: “Projects are becoming more involved and more expensive with a clear trend for people to improve rather than move byinvesting in their own leisure facilities for aquatic exercise, relation and social time at home.” More companies than ever were commended in this year’s contents which encompass residential and commercial pool build and delivery and celebrates individual as well as business achievement. 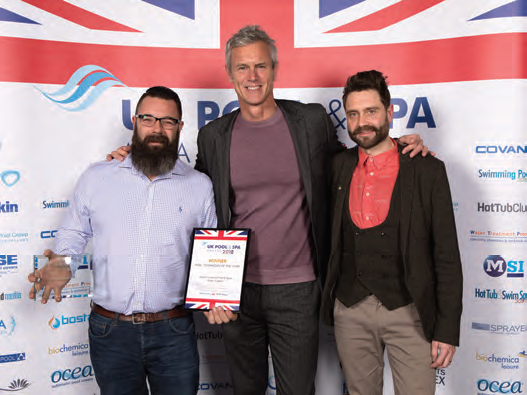 Waterstream, a company that started in the water leisure business as hot tub and spa suppliers, scooped the 2018 Pool Retailer of The Year Title in the category sponsored by OASE, just one of a bucketful of awards for the award-winning team. The jury could not separate two candidates, who will both hold the title of Pool Technician Of The Year for 2018. Alex Martin is a key player in the continuing success of London Swimming Pool Company. His nomination read: “If one could clone Alex and spread them around the pool industry, we would have the very best service technicians in the world! He is keen, tenacious with problem solving and client-focused. Alex’s top priority is ensuring our clients are happy, and often he will go beyond the call of duty, for example, dealing with call-outs beyond our normal working hours.” A stalwart team member, Dave Tuppen of Home Counties Pools & Hot Tubs also received top marks in this year’s contest. “Dave is an outstanding communicator at all levels with a thirst for providing the highest level of service possible,” his nomination read. 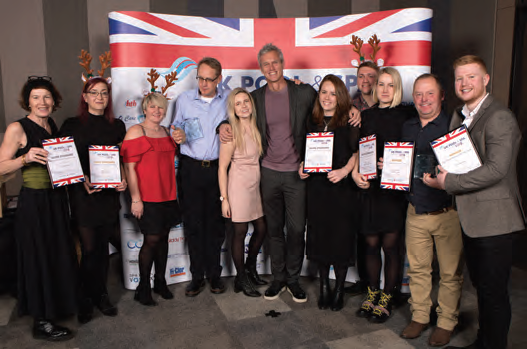 “Dave is incredibly popular with clients and a credit to the company, himself and his family.” Following a recent refurbishment, the Colchester-based team from Merlin Pools & Spas was celebrating a speedy return on investment taking the title of Pool & Spa Showroom Of The Year. 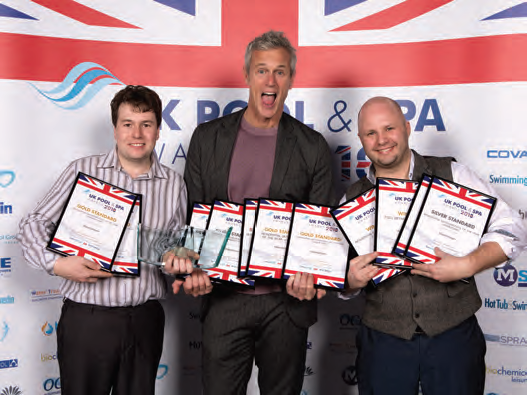 The UK Pool & Spa Awards competition rewards stand-out pools in the public pool sector and there were popular wins in categories such as Hotel Pool Of The Year, Holiday Park Pool Of The Year and School Pool of The Year. A delighted team from Serco Leisure celebrated multiple wins at the event, scooping both Water Leisure Venue Of The Year as well as the title of Water Leisure Operator Of The Year. The organisers and the audience were privileged to be in the company of Mark Foster, one of our country’s greatest sportsmen. As a five-time Olympian, World, European and Commonwealth Champion and holder of eight world records in a career spanning 23 years, Mark Foster is one of Britain’s most successful swimmers. In 2008 Mark was chosen as the flag bearer for the Beijing Olympics opening ceremony which he cites as one of his proudest moments. Since retiring, Mark has cemented himself as a regular commentator on our screens around major international swimming events, an inspiring keynote speaker in both in the corporate world and to aspiring youngsters, through his swimming academy. “Mark more than lived up to his superstar billing at the event, and it was a privilege to be in his company,” said Christina and added: “We have been told many times now, the event just gets better and better. “We will be making sure next year’s tenth anniversary event, raises the bar even higher,” she promised.